Best Oral Surgeon Techniques to Remove Impacted Teeth. Breast Feeding and jaw Development? Wisdom Tooth Removal Recovery Period? How Long Is Recovery Period After Wisdom Tooth Removal? What is the Best Method of Removing Wisdom Teeth? I personally Remove hundred and probably thousands of teeth every year in North Bethesda, Maryland. In this article I am going to share some the simple techniques I have learned and use to remove wisdom teeth. If you are in Rockville MD and in need of getting a tooth removed, please contact me anytime. We are dentists who use sedation. Don’t worry because we even offer Full IV Sedation Dentistry. With no bias, I feel like I am the Best Dentist for Wisdom Teeth Removal. If you are unsure and just want to know How Much it is to get your wisdom teeth out, contact us for a no cost consultation. What is the Best Way to Remove Wisdom Teeth? The Best way to remove any tooth is to remove the tooth as carefully as possible without using a lot of force and without causing a lot of trauma. ( Tooth extraction sedation is a good idea if you have dental anxiety ) For example, what you would not want to do is place an instrument upon the tooth and pull as hard as possible to get the tooth out quickly. It would be a much better approach to separate a multi-rooted tooth into multiple pieces and take it out carefully one root at a time. This kind of tooth extraction technique used by many Dental Surgeon in Rockville Maryland (and at Natural Dentist Associates) is often called an “Atraumatic Tooth Removal” technique. When a tooth is taken out carefully with less force, the result is less swelling and pain later and faster wisdom tooth healing recovery. Below is a detailed list of how we remove different types of impacted wisdom teeth. We use some of the most advanced Dental Surgeon techniques available for tooth removal. Additionally, we also have treatments such as PRF and Ozone Therapy that help Wisdom tooth surgery sites heal quickly and with minimal pain. 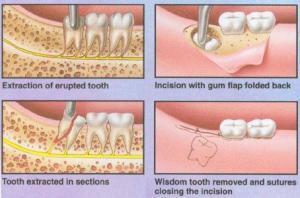 This is a picture of how an Dental Surgeon can remove a two rooted wisdom tooth. Basically, the roots are separated into two pieces and removed one root at a time. Usually, this technique can be done without the need to apply much force when performing a wisdom tooth extraction. Platelet Rich Fibrin is a treatment that helps an Oral Surgery site heal much more quickly and greatly decreases the chances of infection and increases the chances of proper jaw bone surgery. PRF is acquired by obtaining a small amount of the patient’s blood and spinning it in a centrifuge for 13 minutes at 2700 RPMs. 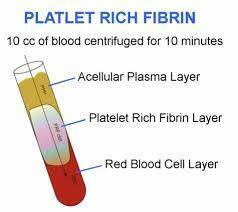 The Spinning process will separate the blood into 3 layers including the Yellow PRF layer of interest. The PRF is a mixture of Fibrin, White Blood Cells and Bone Growth Factors including bone morphogenic protein. PRF appears as a yellow jello-like substance that is placed into the extraction site or dental implant surgery site. How does an Dental Surgeon Remove Impacted Wisdom Teeth? The gum tissue should be gently reflected (not ripped off and all the way displaced), like peeling away but not removing, a small piece of an orange peel. The gum should be manipulated so the tooth can be properly accessed and visualized. Careful removal of any small amount of jawbone that has grown up and around the crown portion of the tooth. Separation of the two roots with a dental drill. Removal of the back root first. This needs to be done because the front root is normally stuck underneath the crown of the 2nd molar tooth in front of it. Removal of the back root is easy once it is separated from the front root. Removal of the front root, which can be easily scooted into the space created by removal of the front root. Placement of PRF is highly recommended especially in lower tooth extraction sites since the lower jaw has less blood supply and is more susceptible to infection. The gum tissue should be gently reflected. The gum should be manipulated so the tooth can be properly accessed and visualized. Removal of the entire Crown of the tooth with a dental drill. In this case the entire crown of the tooth will be underneath of the tooth in front of it. Removal of the front root by sliding it into the space where the back root was, and then out of the extraction site. Careful removal of any small amount of jawbone that has grown up and around the crown portion of the tooth. Horizontal teeth may have more bone removal than partial bony and angular impactions. The extra bone removal called “alveoloplasty” is necessary because there is more bone volume burying the tooth and more access is needed to get the Horizontal tooth out of the jaw bone. Removal of the bottom root, with the access created by removing the top tooth. Careful removal of any small amount of jawbone that has grown up and around the crown portion of the tooth. 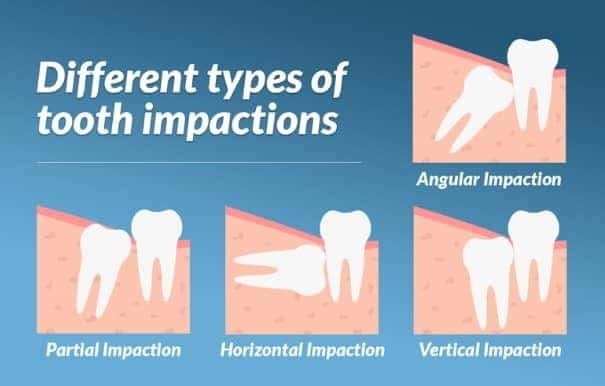 Vertical teeth may have more bone removal than partial bony and angular impactions. The extra bone removal is necessary because there is more bone volume burying the tooth and more access is needed to get the Vertical tooth out of the jaw bone. Removal of the front root into the space created by removal of the back root. Highly recommend! Dr. Baer is the best! Everyone there is so nice and professional. The most pleasant dental experience ever and love their holistic approach! I had three old fillings that needed to be replaced. Natural Dentist Associates. Patient Review "The staff greeted me like an old friend…"
Thanks Dr. Kimberly Baer for keeping my smile healthy and bright.